...my stepfather's computer, on the other hand, is a much older machine. And since my stepfather is not very technically minded, he seems to create shortcuts on the desktop instead of opening files... I found at least five shortcuts to the internet on his desktop, for example. ...I just hope I don't delete something vital... like the operating system or something!! 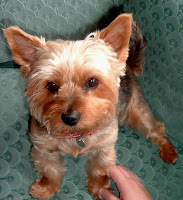 I'm off to Eastbourne tomorrow afternoon... dogsitting for my parents' yorkies. I can probably chalk this one up as a work of mercy, as it allows my mother to go and visit her grandson... and I am not a dog-lover. So the visit will be a penitential exercise... I mean, dogs are ok, but I do prefer proper ones. And the yorkies are incredibly "needy" when separated from my mother. At least I shall have Jess the cat for company. "...With the passage of the SOR's, [Baroness Detta O'Caithain] said, the state had decided that "a citizen's right to manifest sexual orientation is absolute, but the right to manifest religious belief is not." "...Since the January decision by Prime Minister Tony Blair, a government document was released indicating that the school curriculum would be included and faith-based schools would not be allowed to teach traditional social mores "as if they were objectively true."" "LifeSiteNews.com spoke to Fr. Timothy Finigan, a priest of the Archdiocese of Southwark and the founder of the Association of Priests for the Gospel of Life who said, "I don't think it will be productive to negotiate with the government over this. Clearly the regulations are as they are and they have shown that they are not prepared to negotiate or make concessions. 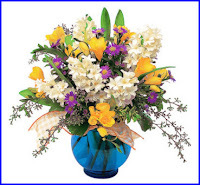 The offer of the adjustment period shows that." "While the exemption requested by the Church for the adoption agencies was turned down by Tony Blair, what they got with the government's offer of a delaying period, said Fr. Finigan, "was a kind of stay of execution. But there's nothing there for them. In the meantime, they still have to refer children to be adopted to homosexual couples." "Militant gay activists, he said, will almost certainly now move on to the next phase of test legal cases against smaller Christian or Muslim institutions such as schools or boarding houses. "The one thing the government doesn't want to see right now is priests and ministers in prison. That means they are going to start with schools or businesses. They've been pushing hard in education for years," Fr. Finigan said." "a friend of the Pope, [he] is considered by Roman prelates to be a leading authority on the Christian scriptures." "A senior Catholic source in England told The Times: “It is a wonderful story of forgiveness and mercy through the eyes of someone who never believed Jesus was God. Moloney has brought the four Gospels together into one. Even if only half of Jeffrey Archer’s readers buy the book, millions of people will read the Gospel for the first time.”"
It seemed somewhat fishy to me: after all, I had heard Moloney on the radio myself, declaring that St. Matthew's Gospel was not to be trusted because it had lifted the whole of the "death of Judas" account verbatim from the Old Testament. I am no Scripture scholar, but I always understood that St. Matthew's whole style was geared towards showing how Jesus fulfilled the Old Testament prophecies: using an OT text which would resonate strongly with his readers to explain how the death of Judas fitted in with the whole plan doesn't make it any less true. However, the Times Online article did seem to suggest that maybe, in my morning confusion, I might have misheard or misinterpreted the whole thing. I duly prepared to eat humble pie by drafting an outline apology for throwing an outraged tantrum at yet another "heresy" ! 1. The Pope did not "bless" the Archer-Moloney novel. 2. The Pontifical Biblical Institute provided the bottled water at the speaker's rostrum for the 3. Archer-Moloney press conference. Its scholars had nothing whatever to do with the book's content. 4. 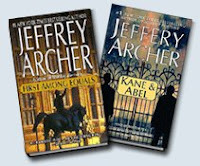 The Archer-Moloney novel was not "published with Vatican approval." 5. No biblical scholar, including my former colleague Fr. Frank Moloney, believes Fr. Frank Moloney to be "the world's greatest living biblical scholar." 6. Fr. Moloney is not "one of the Pope's top theological advisers." 7. The International Theological Commission, of which Fr. Moloney was a member, enjoys the same level of teaching authority as the Philatelic Office of the Holy See -- that's to say: zero. Finally, a comment on another post of mine about the SOR Prayer Rally suggested that the reason for the absence of any of the Westminster Cathedral authorities from the rally was that they had bigger fish to fry, namely the launch of the Archer-Moloney book in Westminster Cathedral Hall... a major booboo, in my humble opinion. "Many people would point out that there is a difference between a book of scholarly investigation, and a novel that employs plausible data, such as this." 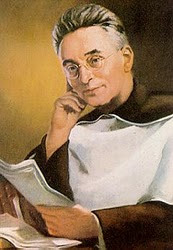 "However, Professor Moloney is a Biblical Scholar of the highest standing within the Church, and a friend of Cardinal Martini." From what I have read and heard, the Cardinal is hardly a bastion of orthodoxy... and besides which, I have a very good Baptist friend - I would trust her with my life, but we have profoundly different views on the Real Presence, and other religious matters. "Perhaps we were somewhat naive, but when the lauch takes place in the Pontifical Biblical Institute in Rome, no less, with the involvement of Cardinal Martini and Bishop Clemens, and the co-authorship of a respected biblical scholar, it is hard to say no." With all due respect, I would say that, no matter how hard it is to say "No," it is the duty of our shepherds to fight against such attacks on the Faith. If the Bishops had said "No" to the Government a little more firmly in the past, then we wouldn't be facing such anti-Christian legislation now. Fr Tim has put up an account of yesterday's Prayer Rally, with photos, on his blog. I was struggling a bit with my new phone, and the pictures I got weren't particularly good (I still can't quite figure out all the settings!) 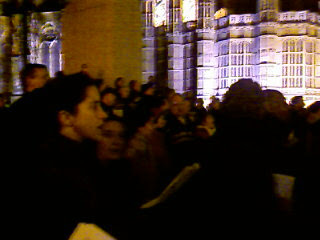 partly because I was clutching the parish flag and the hymn sheets in my other hand. 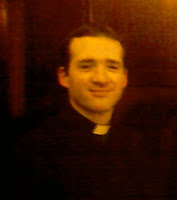 And here's a picture, taken in the pub afterwards, of a certain young non-blogging priest who dared to tell me that my blog was only about hair, nails and shopping. At least it shows he reads the blog occasionally! UPDATE: I see from the comments on Fr Tim's post that Lord Alli claimed, during the debate, that six-year-olds outside parliament were holding placards with homophobic abuse on them. Absolute tosh... the organisers asked us to refrain from waving our parish flag, and there were no other banners or placards in evidence as far as I could see. 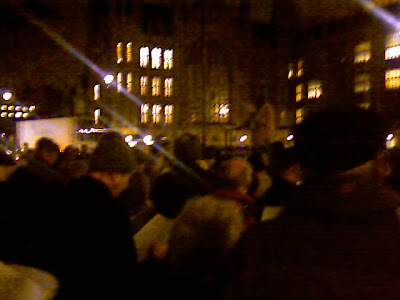 I'm just back home from Wednesday evening's Prayer Vigil outside the House of Lords. As yet, I haven't managed to find out how the vote on the Sexual Orientation Regulations went. The vigil was very good (numbers could have been better, but given the short notice - because of the way the Government are railroading this one through - it wasn't a bad turnout.) I had brought our Parish flag, and started off by holding it up where the wind could gently unfurl it... but unfortunately I was asked by one of the organisers to put it away, as they hadn't wanted banners of any sort. Even without the flag, it was quite amusing to see how more and more Catholics gradually coalesced at the back... and at the various points when we were instructed by the leaders to pray in small groups in our own words, we said lots of traditional prayers, including the Sorrowful Mysteries of the Rosary. Once the vigil was over, a few of us went off to a local pub (we needed to... my feet had gone completely numb after standing still for two hours!) Among the subjects for discussion was speculation on the collective noun for a group of bloggers. So there you have it. You heard it here first!! One of the most ghastly pieces of legislation ever: hundreds of thousands of babies aborted since this went on to the statute books. I don't put many petition posts up (even if I do sign them) but this is one petition you can sign with a clear conscience. 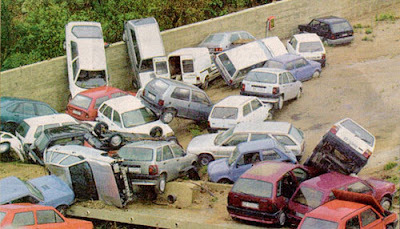 With the high rate of attacks on women in secluded car parks, especially during evening hours, the Sydney City Council has established a "Women Only" car park in George Street. A blonde starts talking to another blonde in a bar, "So, where are you from?" "New York," says the second blonde. "Really? So am I! Here, let me buy you a drink!" "Thanks. Where did you grow up?" "Upper West Side, near 74th." "My God! That’s amazing! That’s my old neighborhood! What school did you go to?" "All private schools. I graduated from Sacred Heart High in '94." "I can’t believe this! 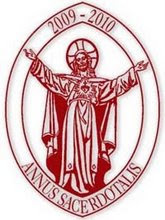 I graduated from Sacred Heart in '94 too!" At this point, one of the bar’s regulars comes in and greets the bartender: "Hi, champ. Anything going on tonight?" "Not much," says the bartender. "Except that the Johnson twins are drunk again." Since the finding of Jesus' tomb (complete with Jesus' bones) by James Cameron was pretty much debunked before it got off the ground, it left plenty of time for another round of "Let's have a pop at the core beliefs of Christianity!" I was disappointed to find that it was being co-authored by Jeffrey Archer. I know a lot of people sneer at his books, but I find that they make amusing and entertaining reads, if you need a bit of a break from reality. And they are a whole lot more entertaining than most of the pap on television. 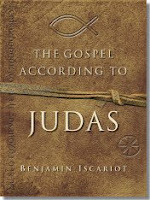 Unfortunately, however, "The Gospel According to Judas" is being promoted as a serious piece of scholarly research. The Church is once again "guilty" of hiding the truth for nigh on 2000 years. Archer's co-author, Francis Moloney, was on Radio 4 this morning, claiming that the idea Judas killed himself is only recorded in the Gospel of St. Matthew, and was a passage lifted directly from the Old Testament, so is not to be trusted. Even more sad is the fact that Archbishop Desmond Tutu has been quoted as saying he found the book "plausible." And I was annoyed to find that a quote about Judas from the Holy Father is being used on Jeffrey Archer's website in such a way as to suggest approval of the thesis. 2000 years of unbroken Tradition says Iscariot betrayed Jesus, and then committed suicide. I guess that's good enough for me. To say anything else is to produce a work of fiction. Technology Has Its Down-Side ! Rats. Somehow or other I've managed to reset my new mobile phone back to factory settings. I guess I shall just have to offer it up... but when I find out who the patron saint of mobile phones is, there will be words! UPDATE: I discovered that, somehow or other, I managed to save my contact list on my computer (despite being convinced that I had failed to synchronise it...) so all of my contacts are now safely inside the phone again! I went to visit my Mum on Saturday. She has a (relatively) new moggy, named "Jessy" which I believe is short for Jessica. I tried protesting that Jessica seemed an odd name for a cat, but to no avail. My family has always had a penchant for waifs and strays. 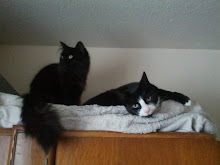 The first cats we had as a family were literally the strays who prowled the council estate where we lived when I was 8 years old (pets were not allowed) - there was a friendly tabby cat who produced batches of kittens at regular intervals, and I'd climb up on the walls to reach the ledge which she had made her home. 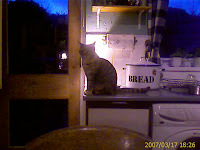 She relished the attention, and would wind herself round my mother's ankles begging for food and attention. My father despised such attachment to animals, and was rather disparaging about "Tibby." He claimed to be more of a dog person, as they were some "use"... Or so he said. However, one day we spotted him, leaning out of a first-floor window, throwing pieces of sausage to a really mangey stray cat which we'd nicknamed "Whitey" (no prizes for guessing why!) 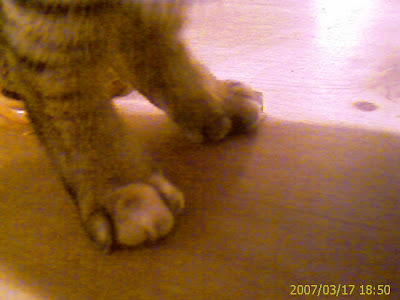 His attachment to Whitey was based on the fact that the flea-bitten tom was more "independent" and didn't fawn all over us. 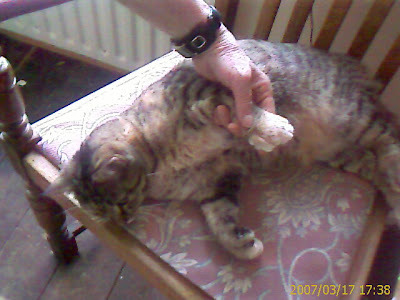 I was heart-broken when some well-meaning neighbour, who objected to the feline yowling, reported the strays to the RSPCA. Cats and kittens were duly rounded-up and removed. The first "proper" cat we had was Otto, the pub cat. He was in residence when my parents took over as managers. A gorgeous, sleek, black, short-haired tom, Otto used to disappear for a few days at a time... until being returned, exhausted, by a neighbour. He must have fathered lots of kittens before my parents decided that it would be better for him "to be seen to." When Otto went missing for the last time, I was inconsolable. I solemnly warned both parents never to mention cats ever again. 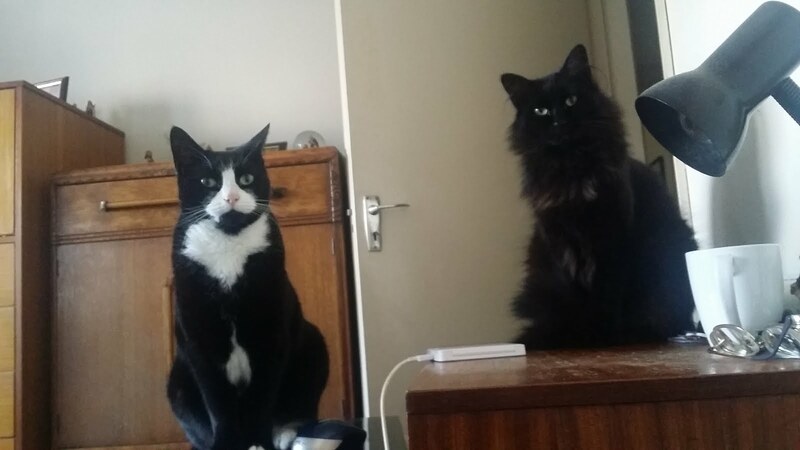 I declared that I would never have another cat. Ever. So when my mother was not at home on my return from school, and the bar-staff were being shifty when I asked where she was, I knew she'd betrayed me by going to the Blue Cross. I threw a strop when my mother returned, declaring that there was no point opening the kitty-carrier box, because no cat could ever replace Otto, and that the kitten could be returned right away. My mother apologised, pointed out that the journey had been a long one, and said that she would return the kitten after she'd given it a saucer of milk. I consented to this plan. Humphrey (so-named because she made a hump the minute she saw the other two) was found as a tiny kitten, abandoned by a railway siding. She was so young that she hadn't been weaned, and needed to be fed by pipette... and made to do her business by application of damp cotton-wool. Finally, little Sophia has been allowed home. 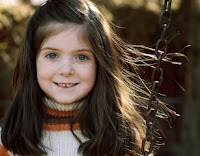 The recovery from the brain surgery will take many more months, but she's out of hospital. The tumour has completely gone. As I drove back rather late, I didn't have any time for blogging. Today was pretty much a wash-out: I was still rather tired from the trip, so lounged around reading (books rather than blogs for a change!) until it was time to go to Mass this evening. UPDATE: Newhousenewjob very rightly pointed out that she's posted her meme answers, and it looks as though she was so quick off the mark that I missed them!! Fr. Dwight has put up the next decoded section (Part 8) of the Gargoyle Code... it gets better and better. Stephen at CSSML has put up his answer to the "weird things" meme... I assume that he's back in Blighty after his trip to Israel. 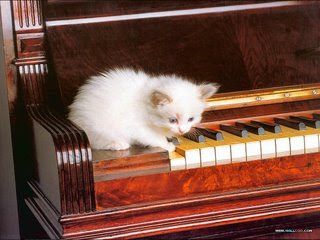 And finally, Antonia has put up the cutest photo - which I have duly snaffled and posted below!